Missile Command is a 1980 arcade game developed and published by Atari, Inc. and licensed to Sega for European release. It was designed by Dave Theurer, who also designed Atari's vector graphics game Tempest from the same year. The 1981 Atari 2600 port of Missile Command by Rob Fulop sold over 2.5 million copies and became the third most popular cartridge for the system. The player's six cities are being attacked by an endless hail of ballistic missiles, some of which split like multiple independently targetable reentry vehicles. New weapons are introduced in later levels: smart bombs that can evade a less-than-perfectly targeted missile, and bomber planes and satellites that fly across the screen launching missiles of their own. As a regional commander of three anti-missile batteries, the player must defend six cities in their zone from being destroyed. The game is played by moving a crosshair across the sky background via a trackball and pressing one of three buttons to launch a counter-missile from the appropriate battery. Counter-missiles explode upon reaching the crosshair, leaving a fireball that persists for several seconds and destroys any enemy missiles that enter it. There are three batteries, each with ten missiles; a missile battery becomes useless when all its missiles are fired, or if the battery is destroyed by enemy fire. The missiles of the central battery fly to their targets at much greater speed; only these missiles can effectively kill a smart bomb at a distance. The game is staged as a series of levels of increasing difficulty; each level contains a set number of incoming enemy weapons. The weapons attack the six cities, as well as the missile batteries; being struck by an enemy weapon results in destruction of the city or missile battery. Enemy weapons are only able to destroy three cities during one level. A level ends when all enemy weaponry is destroyed or reaches its target. A player who runs out of missiles no longer has control over the remainder of the level. At the conclusion of a level, the player receives bonus points for any remaining cities (50 points times scoring level, 1 to 6, first 254 levels; 256, levels 255 & 256) or unused missiles (5 points times scoring level, 1 to 6, first 254 levels; 256, levels 255 & 256). Between levels missile batteries are rebuilt and replenished; destroyed cities are rebuilt only at set point levels (usually per 8,000 to 12,000 points). The game inevitably ends when all six cities are destroyed, unless the player manages to score enough points to earn a bonus city before the end of the level. Like most early arcade games, there is no way to "win" the game; the game just keeps going with ever-faster and more prolific incoming missiles. The game, then, is just a contest in seeing how long the player can survive. On conclusion of the game, the screen displays "The End", rather than "Game Over", signifying that "[i]n the end, all is lost. There is no winner." This conclusion is skipped, however, if the player makes the high score list and the game prompts the player to enter his/her initials. The game features an interesting bug: upon scoring 810,000 (and per 1,000,000 points thereafter), a large number of cities are awarded (176 cities plus the continuing accrual of bonus cities) and it is possible to carry on playing for several hours. At some later stage the speed of missiles increases greatly for a few screens. On the 255th and 256th yellow screens, known as the 0x stages, the scoring increases by 256 times the base value. For good players these two 0x stages could earn over a million points. This enabled them to reach a score of approximately 2,800,000 (although only six-digit scores were shown, so it would display 800,000) and at this point the accelerated rate would suddenly cease and the game would restart at its original (slow) speed and return to the first stage, but with the score and any saved cities retained. In this way it was possible to play this game for hours on end. When the game was originally designed, the six cities were meant to represent six cities in California: Eureka, San Francisco, San Luis Obispo, Santa Barbara, Los Angeles, and San Diego. While programming Missile Command, the programmer, Dave Theurer, suffered from nightmares of these cities being destroyed by a nuclear blast. Missile Command is considered one of the great classic video games from the Golden Age of Arcade Games. The game is also interesting in its manifestation of the Cold War's effects on popular culture, in that the game features an implementation of National Missile Defense and parallels real life nuclear war. In 1983 Softline readers named Missile Command for the Atari 8-bit family eighth on the magazine's Top Thirty list of Atari programs by popularity. Missile Command was ported to the Atari 2600 in 1981. The game's instruction manual describes a war between two planets: Zardon (the defending player) and Krytol. The original arcade game contains no reference to these worlds. On level 13, if the player uses all of his or her missiles without scoring any points, at the end of the game the city on the right will turn into "RF" — the initials of the programmer Rob Fulop. This Easter egg is originally documented in Atari Age (Volume 1, Issue 2) in a letter to the editor by Joseph Nickischer, and is the second one publicly acknowledged by Atari. Missile Command was released for the Atari 8-bit family in 1981 and an identical version for the Atari 5200 in 1982. The same Atari 8-bit port was later used in the 1987 Atari XEGS as a built-in game that boots up if there isn't a cartridge or keyboard in the console. Missile Command has also been included in the compilations Atari Arcade Hits 1, Atari Anniversary Edition, and Atari: 80 Classic Games in One!. It was released as part of the original Microsoft Arcade for the PC in 1993. It was also included in some compilations on Sega consoles: Arcade Smash Hits on Master System, Arcade Classics on Game Boy Retails 4 Published by Nintendo, Arcade Classics on Game Gear and Arcade Classics on Genesis. In late 1980, a two-player sequel Missile Command 2 was field tested but never released although at least one prototype appeared in an arcade in Santa Clara, California. This game was similar to the original except that each player had their own set of cities and missile batteries and the players could cooperate to save each other's cities from the onslaught. In 1992, Atari developed a prototype of an arcade game called Arcade Classics for their 20th anniversary, which included Missile Command 2 and Super Centipede. In 1981, an enhancement kit was made by General Computer Corp. to convert Missile Command into Super Missile Attack. This made the game even harder, and added a UFO to the player's enemies. In 1982 Atari released a game called Liberator, which was seen by some as being a sequel to Missile Command with the situation essentially reversed; in Liberator, the player is the one attacking planetary bases from orbit. Enhanced versions of Missile Command were released for the Atari Lynx and Game Boy. An updated version called Missile Command 3D was released for the Atari Jaguar in 1995. It contains three versions of the game: Classic (a straight port of the arcade game), 3D (graphically upgraded and with a rotating viewpoint), and Virtual. It is the only game that works with the virtual reality helmet from Virtuality. Hasbro Interactive released a 3D remake of Missile Command for Microsoft Windows and PlayStation in 1999. Missile Command with high-definition graphics was released via Xbox Live Arcade for the Xbox 360 on July 4, 2007. On September 23, 2008, Missile Command was released for the iPhone and iPod touch for US$5. It includes two gameplay modes ("Ultra" and "Classic"). Contemporary Missile Command clones include Missile Defense (1981) for the Apple II, Stratos (1982) for the TRS-80, Repulsar (1983) for the ZX Spectrum, and Barrage (1983) for the TI-99/4A. Silas Warner programmed the 1980 clone ABM for the Apple II several years before writing Castle Wolfenstein. 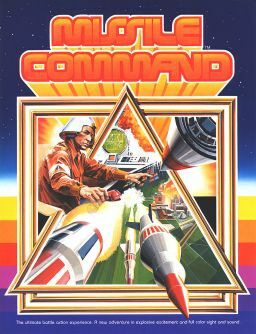 Similarly, John Field programmed the Missile Command-like game ICBM (1981), then went on to create Axis Assassin, one of the first five games published by Electronic Arts. Atomic Command, a clone of Missile Command, is playable on the Pip-Boy interface in the Fallout 4 video game. Missile Command was referenced in the 1980 episode "Call Girl" of the TV sitcom Barney Miller, which features a detective who is hooked on the game. The documentary High Score (2006) follows William Carlton, a Portland, Oregon gamer, on his quest to beat the Missile Command high score record for Marathon settings. In the 2008 episode "Chuck Versus Tom Sawyer" of the NBC show Chuck, a weapons satellite access code is hidden in the (fictitious) kill screen of Missile Command by its programmer, the fictional Mr. Morimoto (Clyde Kusatsu). In the 1982 movie Fast Times at Ridgemont High, Missile Command's "The End" screen is used to help illustrate the film's ending. Two types of world record are monitored for the arcade version of Missile Command: Marathon settings and Tournament settings. Both settings allow the player to start with six cities. Marathon settings give the player additional bonus cities, allowing seasoned players to play the game, in theory, indefinitely. In tournament mode, no bonus cities are awarded at any point in the game; the game ends when all six cities are destroyed. In 1981, Floridian Jody Bowles played a Missile Command arcade game for 30 hours at The Filling Station Eatery in Pensacola. Bowles racked up 41,399,845 points with only one quarter using Marathon Settings, besting the previous known record, according to Atari spokesman Mike Fournell. The record was broken when Victor Ali of the USA scored 80,364,995 points in 1982. It is believed[by whom?] that Ali played the game continuously for 56 hours. Beginning on March 15, 2013 Victor Sandberg of Sweden surpassed all previous records live on Twitch with a final score of 81,796,035 points after 56 hours of play. On December 27, 2013, Sandberg started a new world record attempt which ended after 71 hours and 41 minutes on December 30, culminating in a score of 103,809,990 on level 10,432, 10 points short of getting an additional 176 cities (see 'gameplay' above). On March 9, 2006, Tony Temple, a UK-based gamer, set a world record for Missile Command in Tournament mode confirmed by Twin Galaxies. His score of 1,967,830 points beat the record previously held by US gamer Roy Shildt for more than 20 years. Shildt maintains that he played using slightly different settings to Temple, even though the particular setting he refers to would not have been monitored at the time he set his record; this according to the official Guinness manuals from that era. Temple's record was recognized by the Official Video Game & Pinball Book of World Records and was listed in the 2007 Guinness Book of Records, as well as the Guinness Gamers Edition Book 2008. Tony Temple has subsequently increased his world record on two occasions, culminating in a score of 4,472,570 verified on 9 September 2010. This score took 2 hours 57 minutes, and represents the first officially verified time that a player has passed the highest level at wave 256 on Missile Command under tournament settings, the game difficulty starts over at level 1 again. His nearest rival, Jeffrey Blair, posted a score of 1,874,925 also in 2010. In February 2010, Atari announced that it was talking with several studios to find one that would turn Missile Command into a movie. On January 11, 2011, 20th Century Fox announced that it had acquired the rights to bring Missile Command to film. In May 2016, it was announced that Emmett/Furla/Oasis Films has closed a deal to partner with Atari to produce and finance both Centipede and Missile Command. ^ a b c d e Hague, James. "The Giant List of Classic Game Programmers". ^ Weiss, Brett Alan. "Missile Command - Overview - allgame". Allgame. Retrieved 2 March 2014. ^ a b "The Creation of Missile Command and the haunting of its creator, Dave Theurer". polygon.com. 2013-08-15. Retrieved 2014-06-05. ^ Weiss, Brett Alan. "Missile Command - Review". AllGame. Archived from the original on November 14, 2014. Retrieved August 18, 2017. ^ "The Most Popular Atari Program Ever". Softline. March 1983. p. 44. Retrieved 28 July 2014. ^ "Next Wave: Missile Command 3D". Electronic Gaming Monthly. No. 78. Sendai Publishing. January 1996. p. 132. ^ "Call Girl". Barney Miller. Season 7. Episode 6. December 18, 1980. ^ "High Score". Highscoremovie.com. Archived from the original on April 11, 2016. ^ "Chuck Versus Tom Sawyer Season Episode Guide on". Tv.com. Retrieved 2010-06-02. ^ "Atari's Missile Command, a potential Hollywood franchise". Los Angeles Times. 2010-02-18. Retrieved 2010-06-26. ^ Man Plays Video Game 30 Hours To Win Record With One Quarter. Ocala Star-Banner. 4 May 1981. ^ Graser, Marc (2011-01-11). "Atari arms 'Missile Command' for bigscreen". Variety. ^ Fleming, Mike, Jr. (May 12, 2016). "Atari Classic Arcade Games Centipede & Missile Command Headed for Big Screen". Deadline. Wikimedia Commons has media related to Missile Command.